Origin and Habitat: Bombax ceiba is native to temperate and tropical Asia: China (Fujian, Guangdong, Guangxi, Guizhou, Hainan, Jiangxi, Sichuan, Yunnan), Taiwan, Bhutan, India, Nepal, Sri Lanka, Cambodia, Laos, Myanmar, Thailand, Vietnam, Indonesia, Malaysia, Papua New Guinea, Philippines and Australia (Northern Territory, Queensland, Western Australia). It is cultivated elsewhere. Altitude range: Below 1400 metres above sea level. Habitat and ecology: Hot dry river valleys, savanna. Salmalia malabarica (DC.) Schott & Endl. 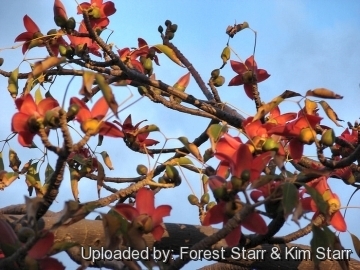 Description: The red cotton tree (Bombax ceiba) is a medium- to large-sized tropical tree that usually grows to an average of 20-25 meters, with old trees up to 60 meters in wet tropical weather. It has a straight tall trunk buttressed at base that bears conical spines to deter animal attacks. Its leaves are deciduous in winter. Crimson red flowers with five petals appear in the spring before the new foliage and are one reason that the tree is widely planted. 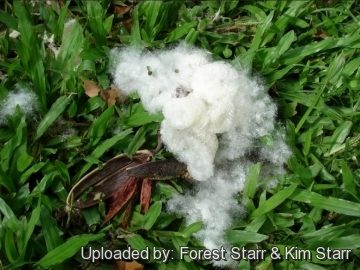 It produces a capsule which, when ripe, contains white fibres, like cotton, which has been used as a substitute for cotton (hence its common name). Leaves: Glabrous, palmately compound with about 5-7 leaflets radiating from a central point, usually 7-10 cm wide, 13-15 cm long. Leaflets are elliptic-obovate to oblong-lanceolate glabrous with a size of (5-)10-16(-23) cm long, (1.5-)3.5-5.5(-9) cm wide, lateral veins 15-17 on each side of midrib, ascending, base broad or tapering, apex acuminate. The leaf's long flexible petiole is 10-20 cm long. Secondary petioles 1.5-4 cm in length. Stipules minute and caducous. Flowers: Bright, attractive, crimson red but odourless, actinomorphic, bisexual, 7-11 cm wide, 14 cm in width with 5 petals born solitary or clustered, axillary or sub-terminal, crowded at or near the ends of the leafless branches, when the tree is bare of leaves. Pedicel is very short. Petals five red, sometimes orange-red, obovate-oblong, twisted and thick up to 8-12 or more cm in length and breadth of 2-4 cm, fleshy. Calyx, thick, cup-shaped, irregularly 3-5 lobed, 2-3(-5) cm in diameter, yellowish silky on the inside and smooth outside. Staminal tube short. Filaments more than 60 thicker at base than apex, outer series in 5-6 bundles, each having 10-15 stamens, inner series bifid, central filaments with 10 stamens shorter, entire. Style is shortly clavate and little longer than stamens and stigma light red, up to 9 cm long. The margin is cleft into 3-5 valvate fringes. Ovary pink, 1.5-2 cm long, with the skin of the ovary covered in white silky hair about 1mm long. Occasional specimens of white, pale-yellow coloured flowers separately or among the red coloured flowers are also reported. Fruits (capsules): Ellipsoid, about 10-15 cm long, 3-5 cm thick, woody, 5-valved, oblong-ovoid, minutely apiculate light-green, brown when mature with deciduous calyx .Which, when ripe, contains numerous seeds packed in dense white fibres like cotton. Seeds: Numerous, 6-9 mm long, obovoid, smooth,oily black or grey in colour. Phenology: February to April is the flowering season. Fruiting in summer. 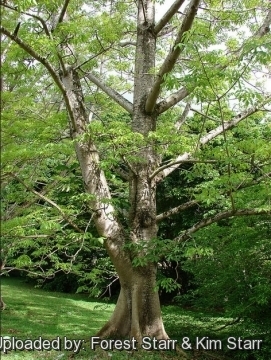 Bombax ceiba var. leiocarpum, distinguished by the glabrous ovary and fruit, is found in Northern Australia. Notes: Bombax ceiba was formerly cultivated for its seed floss (kapok), which is of lower quality than that from Ceiba pentandra. 1) Brown, Stephen H. (2011). 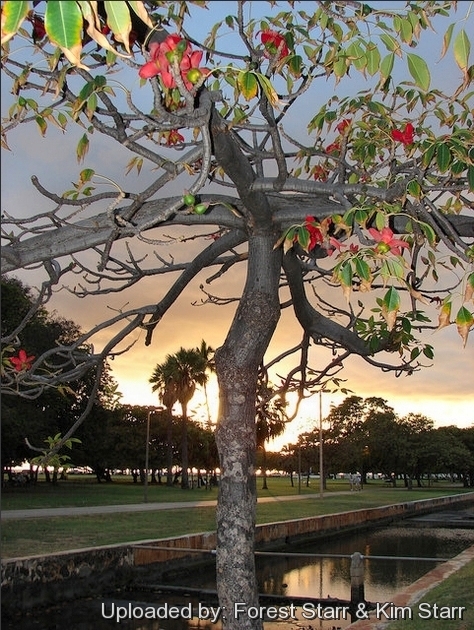 "Red Silk-Cotton; Red Cotton Tree; Kapok". Gardening Publications A-Z. University of Florida. <http://lee.ifas.ufl.edu/Hort/GardenPubsAZ/BombaxCeibaRedSilkCottonTree.pdf> Web. 3 Dec. 2014. 2) Wikipedia contributors. "Bombax ceiba." Wikipedia, The Free Encyclopedia. Wikipedia, The Free Encyclopedia, 19 Nov. 2014. Web. 3 Dec. 2014. 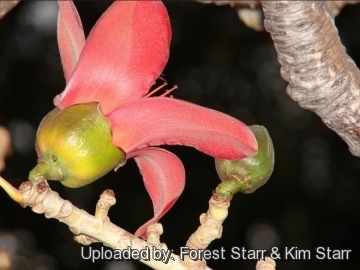 4) “Bombax ceiba” in Flora of China @ efloras.org <http://www.efloras.org/florataxon.aspx?flora_id=2&taxon_id=242420835> FOC Vol. 12 Page 300, 301 accessed on 3 Dec. 2014. 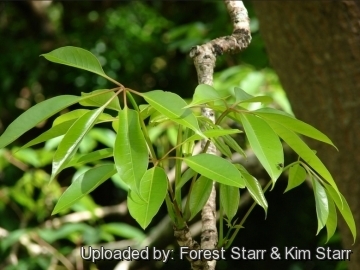 Cultivation and Propagation: Bombax ceiba, is quite easily grown from seed and is planted in parks and on roadsides as an avenue and shade tree. In built-up areas it will prove to be a troublesome one as the roots effect forceful entry into cracks in buildings, roads, drains, etc., and pass through or under and disturb foundations. It grows best in subtropical climate and heavy rainfalls but fairly drought-resistant too. Grow in good light, don't over-water. Saplings can be effectively grown in containers for many years before becoming too large and requiring to be planted into the ground. In this manner one can move them out of the cold into a warm position in a glasshouse or indoors behind a sunny window to prevent frost damage. It can be also trained as a bonsai tree. Exposure: It is a strong light-demander suited for full sun open positions. Watering: It is drought tolerant, and suited to monsoon climates with dry and wet seasons, but reach its full size of 60 metres only with ample water availability throughout years. Hardiness The are only suited for tropic and subtropics and provide a minimum winter temperature of 10-13 C as they cannot tolerate frost. Uses: It is cultivated for its kapok (the hairs of the carpel walls, used in stuffing mattresses etc.) Kapok fibre is light, very buoyant, resilient, resistant to water, but it is very flammable. The process of harvesting and separating the fibre is labour-intensive and manual. It is difficult to spin, but is used as an alternative to down as filling in mattresses, pillows, upholstery, zafus, and stuffed toys such as teddy bears, and for insulation. It was previously much used in life jackets and similar devices until synthetic materials largely replaced the fibre. The flower is used as a common ingredient in Chinese herb tea. Although its stout trunk suggests that it is useful for timber, its wood is too soft to be very useful. In general, its uses are ornamental, as fiber and/or wood, and for folk medicines. 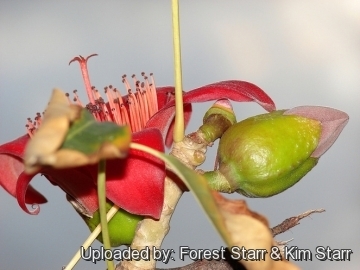 The flowers are very attractive to local wildlife, with many birds like the Japanese White-eye, a type of fruit eating bird, which often draws a hole in an unopened Bombax ceiba flower bud. Honey bees, and bumble bees also attracted to the flowers to collect pollen and nectar. Because the flowers attract many insects, Crab spiders can be occasionally found on a fully opened flower, hunting bees. Reproduction: Seeds. Sow in trays, pots, etc. in a well-drained seedling mixture containing one-third sand in a propagator or warm place with a minimum of 25°C to a soil depth of 5 cm. The optimum temperature required is 27°C, with 30°C for maximum germination and plant growth. Seeds are best sown in spring and summer . Germination may take from two to six weeks. It grow reasonably quickly when they are young. It also can be started from cuttings.